9pm with our orange t-shirts on that Scott had made. It had a really cute little gremlin looking creature on the front of it. I wisely skipped the line for the bar and went into dream to get a pint of beer, quickly followed by a few others who realized where I was going. 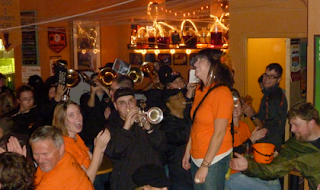 We all were hanging out when the OSU marching band made their rounds through the bar playing the alma mater. When they found out why we were all dressed in Orange they then put Danielle up onto a table and the entire bar of about 60 people and a band with instruments sang and played happy birthday to her! She was lit but I was happy to find out that she definitely remembered it the next day. It was probably one of the coolest birthdays I’ve ever seen anyone get. She better have been nice to Skeeter for putting it all together! Aaron showed up with Jason Schilling and some others just in time to see the whole thing go down along with Chris 20 minutes later. getting him a season pass to SkiBowl (I emailed them about him being on all their marketing material and deserving a pass... and they actually gave it to him!). Everyone had a great night, especially Danielle whom I was blown away made it through the entire night without passing out... probably with Alexa and Amanda right behind her in terms of drunkenness. Emily and I ended up giving Alexa a ride home and stopping shamelessly at McDonalds for some grub.